Liftoff of space shuttle Atlantis on its STS-132 mission, the shuttle's 32nd and final planned mission to space since it began flying in 1985. Launch was on time at 2:20 p.m. EDT. If NASA continues operating at 2010 funding levels as it has been doing, the agency will have enough money for a third space shuttle mission this year, which would be the last, a senior NASA official said today (Feb. 14). The White House released its fiscal year 2012 budget request today, which, if authorized, would freeze NASA spending at 2010 levels. For the space agency, that would mean an annual budget of $18.7 billion, the same level of funding the agency has been allocated under the current continuing resolution – a stopgap measure lawmakers have enacted while they debate a formal 2011 budget. "Because these are tough fiscal times, tough choices had to be made," NASA administrator Charles Bolden said today during a press conference. "Our number one priority is safely flying out the shuttle." NASA has three more space shuttle flights planned before it retires the shuttle fleet. 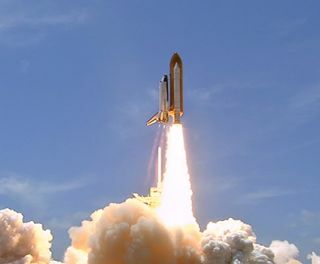 The last mission, a planned June voyage of the shuttle Atlantis, was sanctioned by the October 2010 NASA Authorization Act passed by Congress and signed by President Barack Obama. Last month NASA set a launch date of June 28 for Atlantis' mission, called STS-135. Yet funding for that flight has not yet been appropriated, and whether or not Atlantis flies depends on how much money NASA receives, said Bill Gerstenmaier, NASA's Space Operations chief. The current continuing resolution expires March 4, and lawmakers are working to pass another that would extend through September. "The '135' question will get addressed through the continuing-resolution process for fiscal year 2011," Gerstenmaier said. "We're pressing on, assuming we're going to go get the flight, and we'll see what happens." The final mission would deliver spare supplies to the International Space Station to help outfit the orbiting lab for the period following the shuttles' retirement. Once the shuttles are grounded, NASA will have to rely on international unmanned cargo ships to haul supplies to the station until U.S. commercial cargo spacecraft become available. "From a technical standpoint, we have extremely strong justification for that mission. It gives us some more margin for commercial resupply," Gerstenmaier said, explaining that Atlantis' flight would enable the station to last longer without private U.S. cargo deliveries. "Our estimates show if we do not have the flight, we will need the cargo services to be in place in 2012." If current levels of funding hold, that should be enough to allow NASA to fly STS-135. "Only if we get some severe cuts would we not be able to go fly the flight," Gerstenmaier said.